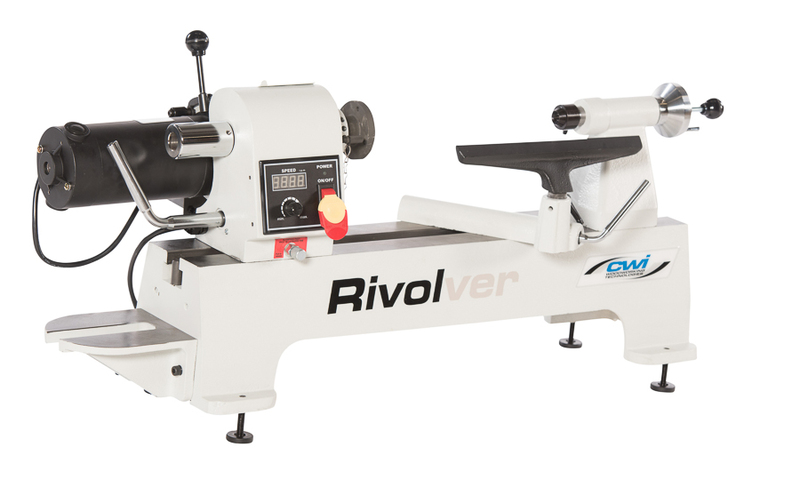 Rivolver wood lathes are built by CWI Woodworking Technologies to be best in class machinery with the features, performance and quality that serious woodworkers are looking for whether in the hobby, educational or industrial woodworking industries. Our wood lathes feature lots of cast iron, easy to use controls, convenient operational features and excellent capacities. 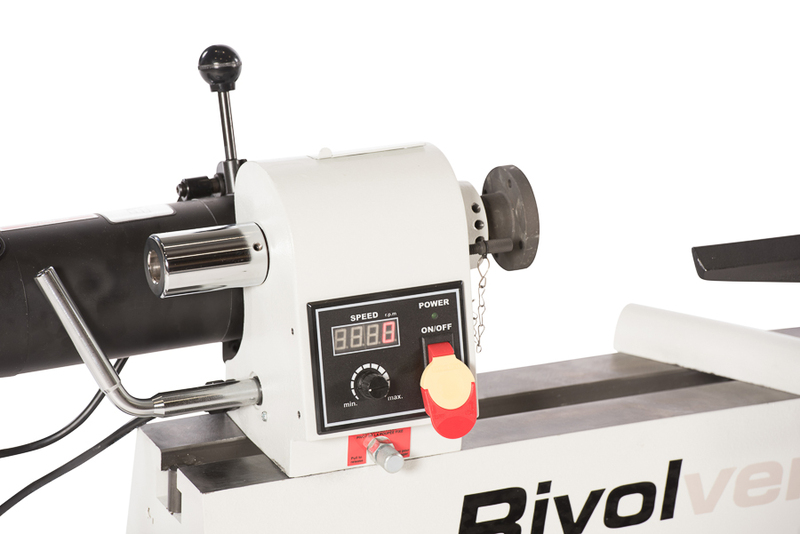 The Rivolver CWI-WL200 is a very high quality bench top wood lathe with a 12” x 18” turning capacity built for educational or high demand hobby users looking for a compact lathe with excellent features and big performance. The CWI-WL200 is perfect for turning pens, goblets, small spindles, candle holders, pepper mills and bowls up to 12” in diameter. With the included cast iron outboard turning base users can actually spin bowls up to 19.5” in diameter but taking light cuts of course. This solid cast iron machine weighs in at 145 pounds for excellent stability when users want to tackle a bigger project and of course runs so smooth it is almost not noticeable the headstock is even turning. There is an optional bed extension available for users wanting to tackle longer spindles up to 49” in length. If bench space is a concern an optional steel stand is also available. 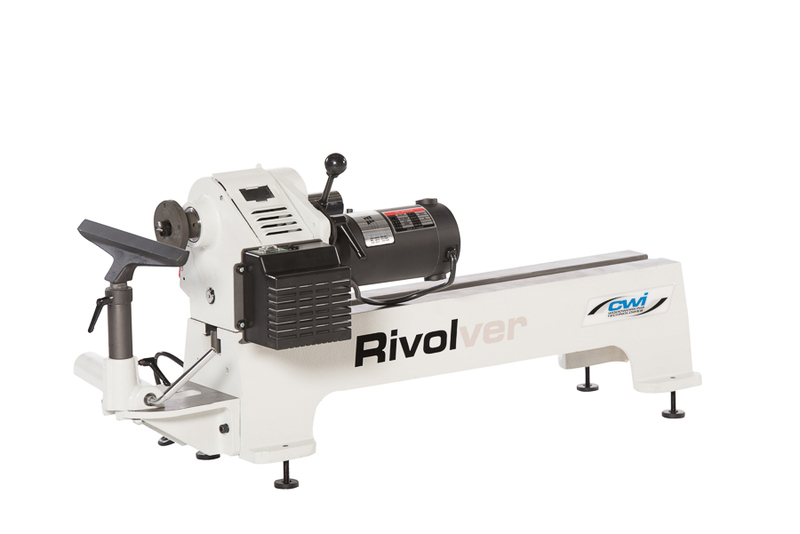 The Rivolver CWI-WL200 is powered by a very strong ¾ HP motor which drives a poly flat groove belt in three different speed ranges infinitely variable from 300 to 3600 rpm. There is an electronic digital read out which accurately keeps track of the speed for the user as they adjust the rotary speed dial. There is a quick release lever to easily allow the user to change between the speed ranges of 300-900 RPM, 600-1800 RPM and 1200-3600 RPM. There is a convenient forward and reverse switch to allow the user to reverse the rotation of the spindle for sanding operations and special cuts. The solid locking quick release lever on the headstock allows the user to pivot the head 360 degrees with positive stops at zero and 180 degrees for outboard turning larger bowls and plates. The headstock and tailstock both use #2 Morse taper accessories and the headstock uses a standard 1” x 8 TPI thread for adapting standard face plates and lathe chucks. A 3” face plate, spur center, live center and 12” tool rest with 1” post are supplied standard with the machine. The headstock includes the option of indexing of the work piece in 36 different solid locking positions based on 10 degree increments. 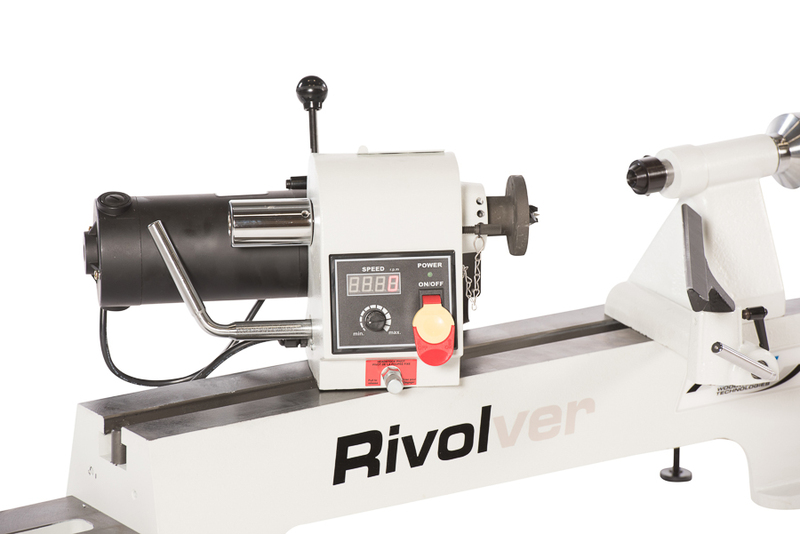 The Rivolver CWI-WL200 bench top wood lathe is truly a work horse in a small package which will allow the user to tackle many projects that just can’t be done on other bench top lathes. The performance is amazingly smooth and accurate and a pleasure to use for any woodturner. Browse the product archive. Type: Wood Lathes. Brand: Rivolver. Bookmark the permalink.